The Verge may have called drone selfies (or “dronies” as they are sometimes-affectionately called) the height of vanity, but realistically, they’re just the natural next step in the trend of UAV (unmanned aerial vehicle) photography. After all, innovators have tried to come up with all kinds of gear to make taking self portraits easier — so why not use these much-less-silly devices to lend a hand? But how do you get a really solid drone selfie? First, you’ll want to practice. As drone photography expert Jeff Foster points out, UAVs are expensive and can be a little fragile — the last thing you want is for your new toy to get whisked away while you’re trying to take a picture of yourself (or worse, to accidentally bean yourself in the face with it). Even if you’ve flown a UAV before, make sure you really know how yours works. 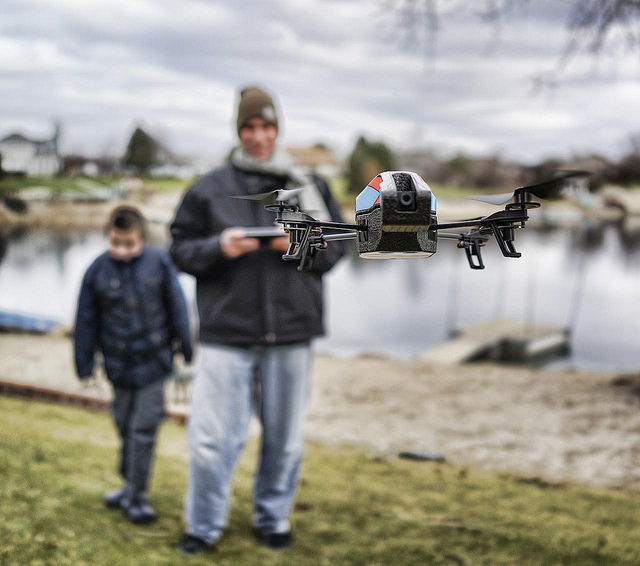 Spend some time just learning how your drone flies and what kind of photos and video it takes. That way, you can better plan your images. Second, scout a cool location. Amit’s dreamy dronies got popular online because he posted up on beautiful Bernal Hill. Instead of posing in front of, say, your disastrous office space, take it outside and really go to town filming not just you, but your location. Consider taking a dronie when you’re with friends or doing something interesting; it’ll make for a more fun photo, and will utilize the technology better. You’ll also want to avoid potential pitfalls, like trees or (especially) powerlines, which is another reason that scouting is key. This is just good drone protocol anyway, but especially if you’re going to be trying to take photos or video of yourself, you want to ensure that nothing gets in the way. Regarding your apparel, remember that your drone won’t be taking an ultra-close-up, so your clothing doesn’t need to be perfect — but it should stand out from your background. Plan an outfit that will look significantly different than the color of your location, so that as the drone zooms toward you, you’ll be easier to spot. Finally, wait for a dry day — even if you’re itching to go out and shoot. “Moisture is enemy of electronics,” according to Jeff, so conditions definitely matter — and if you’re going to be trying a lot of different things with your drone, you’ll probably want a nice, non-rainy day. As for actually taking photos, be sure to take a lot; training the camera on you while also piloting the UAV can be a real challenge, and you probably won’t get it right the first time. This also means that, for an extended period of time, you’ll need to be aware of your face and what it’s doing. Try not to let your frustration or confusion show — just keep smiling and keep shooting and eventually, you’ll get the hang of it. DJI Phantom 4 Pro Specs: Controller Has A Built In Screen!